Cinnamon Sugar Dessert Crepes are the perfect light ending to any meal. Speaking of meals, you know we don’t always play by the rules. We have been known to eat frozen custard for dinner. 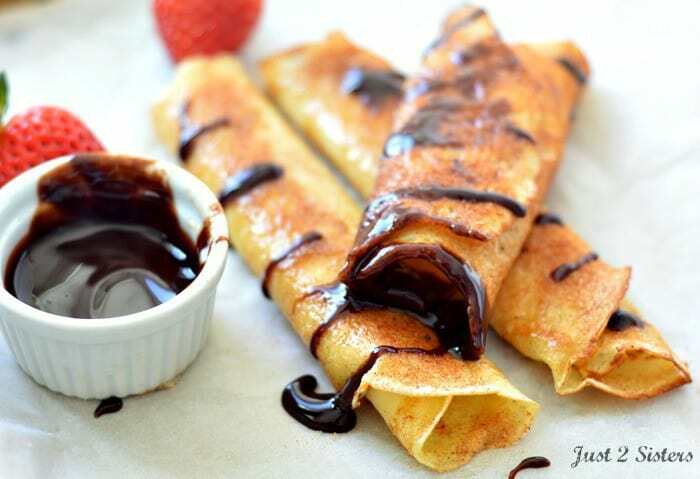 Why not eat Dessert Crepes for breakfast or lunch? A spring brunch would also be a great place to show off your Cinnamon Sugar Dessert Crepes. We topped the Dessert Crepes with a store bought chocolate sauce. You could easily make your own. Serving the Dessert Crepes with assorted fresh fruit and whipped cream would also be a tasty option.